A Learning Adventure Just In Time For Back-To-School! Are you ready for another fun but educational DVD from Barney? Then check out Barney: All About Opposites! Opposites attract, especially when there’s fun and good friends involved! Join Barney and his friends for exciting adventures and games in Barney®: All About Opposites, arriving on DVD, Digital Download and On Demand July 10, 2012 from Lionsgate and HIT Entertainment. Come along as everyone’s favorite big purple dino teaches about the opposites that we see around us every day, including stop and go, hot and cold, big and small and more! 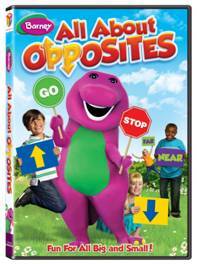 My son loves this newest Barney DVD and I loved watching him learn about opposites and learn along with Baby Bop!